Unknown photographer, Arab Ladies’ Union group at K.D. Hotel (i.e., King David Hotel). Sept. 15. ’44. Courtesy: Library of Congress Washington, DC, Matson Collection. From the project by Ines Schaber, Dear Jadwa, 2009. 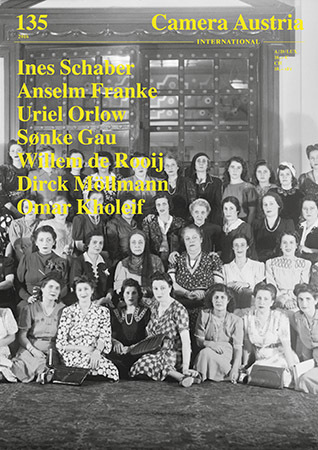 “History is equally a question of knowledge and narration, and very much a question of the position from which it is told,” writes Anselm Franke in his essay on the works of Ines Schaber. He also writes that “a society receives its characteristic imprint at the margins.” With these words, Franke not only approaches the political core of Schaber’s works; he also sums up the key interest of the present issue: the image’s oscillation between the visual and non-visual, between seeing and knowing, a resonance between words and images that harbour an unnamed location from which they show things and from which they show themselves in order for something else to simultaneously disappear. In his essay on Uriel Orlow, Sønke Gau also operates on the assumption that history is not simply a given and can’t be seen as an objective, homogenous, linear order. Methods of microhistory are one of the artist’s key points of reference in his works and are based on extensive research into histories. Accordingly, the points of departure for his research are specific locations that can be described as secondary settings. Places connected to events not accounted for in or omitted from the hegemonic historical account—its “blind spots” that are no less important, but represent intersections of various narratives. In an expanded Forum, we present ten young positions that illustrate the various tendencies in contemporary photography: formal experiments, approaches involving installation and performance, working with or establishing image archives. This issue is rounded off by Jan Wenzel‘s “The Revolving Bookshelf,” by responses to newly published books, and 18 reviews from seven countries, including: Black Chronicles. Photographic Portraits 1862 – 1948, National Portrait Gallery, London, United Kingdom; Made You Look. Dandyism and Black Masculinity, Photographers’ Gallery, London, United Kingdom; Ingeborg Strobl, LENTOS Kunstmuseum Linz, Austria; Mohamed Bourouissa: Hustling, Basis, Frankfurt, Germany; Watched! Surveillance, Art and Photography, Hasselblad Center, Gothenburg, Sweden; Triennale 50 JPG: 50 Jours pour la photographie, Centre de la photographie Genève and various venues, Geneva, Switzerland; Aglaia Konrad: From A to K, M – Museum Leuven, Netherlands; Danny Lyon: Message to the Future, Whitney Museum of American Art, New York, United States.